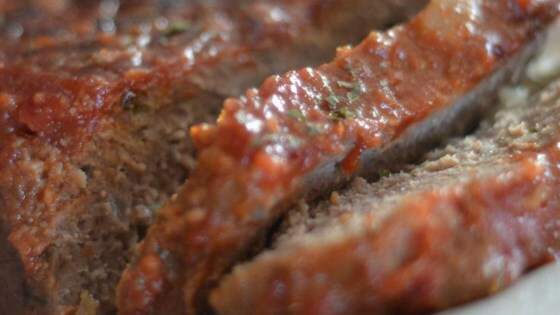 "This is an easy tasty meatloaf made healthier with less sugar, low-fat milk, added parsley and whole wheat bread crumbs. Enjoy!" Preheat oven to 350 degrees F (175 degrees C). Lightly grease a 9x5-inch loaf pan. Press brown sugar in the bottom of prepared loaf pan and spread ketchup over sugar. Mix ground beef, milk, eggs, salt, ground pepper, onion, ginger, bread crumbs, and parsley thoroughly in a mixing bowl. Shape into a loaf and place on top of ketchup. Bake in preheated oven until no longer pink in the center, about 1 hour. An instant-read thermometer inserted into the center should read at least 160 degrees F (70 degrees C). This recipe is a healthier version of Brown Sugar Meatloaf.